UniSource Energy Tower (formerly Norwest Bank Tower) is a postmodern skyscraper that was completed in 1986. 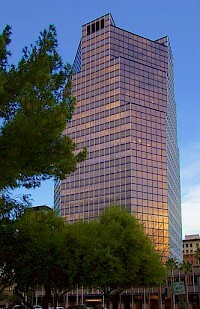 The tower is the tallest building in Tucson, Arizona and is the thirteenth tallest in Arizona. The building rises 330 feet with 25 floors. It was designed by Curtis W. Fentres, FAIA, RIBA of Fentress Architects in 1986. It is the tallest building between San Antonio and Phoenix.